We've started to send home letter formation practise sheets for the sounds that we are learning and reading books. Check your book bags! Rainbow is a Reception (Foundation Stage 2) class with 23 pupils. The class is taught on Mondays, Tuesdays and Wednesday mornings by Miss Cooper. On Wednesday afternoons, Thursdays and Fridays, Mrs Higgins teaches the class. Mrs Adler, Mrs Hibbard and Miss Willis help us across the week too. Please click on the link below to download a copy of this terms Home Learning Challenges and a copy of the words for reading and spelling. Please click on the link below to download a copy of the new dinner menu. You should also have received a printed copy in your child's book bag. Due to school being closed for Easter Monday this affects the meat delivery, so Monday's menu will be for Tuesday. We have had a fantastic first day of term! We all became explorers and went on a Minibeast hunt. We found lots of Minibeasts lurking in dark and quiet spaces on Dungworth Green. Everyone had lots of fun spotting Minibeasts and trying to identify them. Forest school will be taking place regularly please could you ensure that your child has a pair of wellies and waterproofs in school. We hope you have had a lovely break and are ready for the Summer term. We enjoyed listening to all of the lovely things you have been up to over the holidays. P.E days in Rainbow are on a Wednesday and Thursday. Please ensure your child has their P.E kit in school. Today we had a lovely day at the Butterfly house. We met some Minibeasts and some of us even got a chance to hold them. We also got a chance to see lots of other animals. Please keep checking back on our blog for the photos. Well done to these two children in Rainbow class who got star of the week this week. We had lots of fun learning all about Pancake day. We even got a chance to make our own pancakes and eat them! Everyone got a chance design and make their own topping. The pancakes were very yummy! We have sent home the new learning challenge menu for this term. Please could you check in your Child's book bag. All homework challenges need to be returned to school by Thursday 28th March. Please click on the link below to download a copy of our home learning challenges this half term. Today we went on a Winter walk down to Dungworth green. However the weather was so sunny today we were able to spot signs of spring instead. We saw lots of flowers beginning to grow. We were even able to go on our walk without our coats or jumpers on, it was soo hot. We have been learning all about floating and sinking. This week we have designed what we want our boats to look like and explored different materials we could make our boats out of. Today we got a chance to start making our boats. We used hack saws to cut up the wood to make our boats. We would like to say a big thank you to Stoneface Creative for coming in to help us make our boats! On Tuesday 5th February it was Chinese New Year. This year it is the year of the Pig. This week we have been learning all about Chinese New Year and how it is celebrated. We even got a chance to make our own stir fry! It was lots of fun! In Maths this week we have been learning all about number 10. We went outside and found 10 different things in our playground. we went on a Numicon hunt round the playground as they had disappeared from our classroom. We explored different ways we could make 10 by adding two or three numbers together. Click on the link below to play the number bonds game to 10. On Friday it snowed we had lots of fun in the playing in it! We made snowballs, explored how long it took snow to melt. We even got a chance to build things out of snow. This week we had a man come from the skipping school to teach us all how to skip. We all got a chance to practice skipping, throughout the morning we got a lot better. It was lots of fun! We had a huge surprise in our Gymnastics lesson today! When we walked through the door there was lots of apparatus set up in the hall, there was table tops, benches, climbing frame and lots of mats. There was time to explore the apparatus to see how we could move on there, lots of us jumped off table tops that was small, middle and high heights. During our time in Gymnastics we explored safely how we travelled on all of the apparatus some of bear crawled up the ladders, some of us walked like we was on a tightrope, some of us moved like snakes pulling our bodies to the end of the bench. FREEZE!! When this was shouted Faye gave us instructions to show her some of our Gymnastics moves that we have been learning these past few weeks. On the apparatus we showed Faye how we can do a pike, tuck, straddle, star, pencil and flight. It was such a busy lesson but it was a lot of fun, we can't wait to be able to do that again at some point. We would like to say a HUGEEEEE thank you to Faye for giving us this fabulous surprise!!! Uh Oh! We have had news that the penguin from our Lost and Found book and some Pirates have had a CRASHHHH!! We have been thinking about how we can help them? Lots of us have suggested we make new boats but first we need to test out what objects float or sink. We have all been making lots of predictions about which objects we think will float or sink! We can't wait to see what happens with our objects!! In P.E with Mrs Higgins we have been learning all about ball skills. We have had lots of fun throwing, catching, dribbling and rolling balls to each other. It has been cold in Dungworth. We took this opportunity to go on an ice hunt in the playground and look at how ice melts. We had lots of fun collecting it and playing with it in its different forms. This week in gymnastics we moved and travelled in lots of different ways! We moved like a bear, a crab, a giraffe, a monkey, a spider and a crocodile! We also did lots of gymnastics poses that included star, pike, straddle, tuck and bridge. We have sent home the new learning challenge menu for this term. Please could you check your Child's book bag. All homework challenges need to be returned to school by Thursday 14th February. Please click on the link below to download a copy of our home learning challenges this half term. In P.E we have been learning different gymnastic moves. Today we learnt straddle, pike and tuck. We also experimented with different ways of travelling round the hall. We were very lucky in Rainbow class, Father Christmas came to visit us before we broke up for Christmas. We each received a special gift and sang Christmas songs. It was lots of fun! We had lots of fun watching The Singing Mermaid at the Crucible theatre. The story was told using puppets. We enjoyed watching the performance and joining in with the actions and singing. 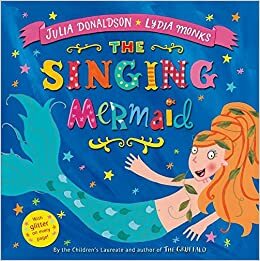 The Singing Mermaid was written by Julia Donaldson and illustrated by Lydia Monks. Come and find it in our Reading Garden. 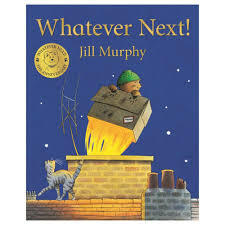 We have been reading Whatever Next by Jill Murphy. This week we have been learning all about speech bubbles. Everyone has written a speech bubble for one of the characters in the story. We had lots of fun making bread stick sparklers after Bonfire night. Everyone got a chance to make their own sparkler. When it was dry we got to eat them! They were yummy! Please click on the link to download a copy of our home learning challenges for this term. All home learning needs to be returned to school on the 13th December. Every child should have received a paper copy of the new menu. This will be starting AFTER HALF TERM. If you would like to see/ download a copy of the new menu please click on the link below. We have had lots of fun with this story. 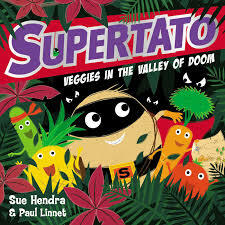 First we designed our own Supertato giving it a special superhero name. Then we had to capture all of the Evil Peas that had escaped, luckily they were trapped in jelly! We used knives and folks to carefully cut the peas out of the jelly and put them in our special force field (purple bowl). Making Leek and Potato soup! We had lots of fun making Leek and Potato soup. First we all peeled all of the Potatoes. Then we chopped up the leeks and potatoes. This helps us with our fine motor skills. Next we placed all of the vegetables into 2 pans and added water. Then we put the soup on the hob to cook. Once the soup was cooked we put it in a blender to mash up the vegetables. Finally we all got to try our lovely soup! Some children even had more than one portion. We have been using hammers to drive tees into pumpkins. This helps us to develop our muscles ready for writing. It was great fun! Once the pumpkin was full of holes we cut it open and felt inside. It felt "wet", "slimy", "sticky" and "gooey". The skin felt "hard", "smooth" and "slippery". It was hard work cutting up sections of the pumpkin. We took out the seeds and washed them. Some of us want to plant them to see what happens - watch this space! This week, everyone will have a Home School Learning log and a home reader. Please bring these to school daily. We will endeavour to read with your child every day and will change this book if necessary. Some books require the adult to read sections and for your child to join in with the speech bubbles. Encourage your child to look at the pictures and sound out letters they know in words such as 'man' to read aloud. Question your child on the characters, setting and story. Please record daily reading in the home/school log. Your child can earn certificates and prizes for reading at home. The letter formation folder will be updated when we learn a new sound and what it looks like. Please keep these in your bag each day, however do not feel that they must be completed daily! Practise sounding out these letters using 'pure sounds'. A reminder can be found here: how to say the sounds . Your child should be able to see the letter and instantly know what sound it makes. The yellow letters can be traced over with fingers and then pencil to understand how to form the letter. We hold a pencil in a tripod grip and sit at a table. Every letter starts on the line where we "smile in" to the letter before we "smile out" at the end. Underneath the letters is plenty of space for your child to practise on their own. If your child is finding this hard (which is completely normal at this stage), practise on a larger scale; you could write in mud with a stick, using paint, shaving foam, in rice or sand. Bath crayons are great, as is chalk outside. Practise using an 'air' pencil (using your finger to draw it in the air) or use water and a paintbrush to draw them on the floor or wall. Children will master their handwriting when their muscles have developed on a larger scale before it will transfer to the small, fine motor skills required for handwriting. Practising a 'swishing' movement (e.g. with a magic wand, stick or ribbon stick) will support muscle development for mastering the 'lead in' to each letter we write. Please do not keep water bottles in book bags. There is a charge for lost or damaged books. It was a warm and sunny day for us to go Potato Picking on Mrs Hague's farm. We walked through our village, along Pudding Poke, and up into the fields. We learnt where potatoes come from, how they are grown, and what they become when they've been picked. Did you know that Mrs Hague's white potatoes become chips for our local fish and chip shop? We all enjoyed using our hands, trowels and spades to dig the soil for the potatoes - it was like finding treasure! It was hard and mucky work but we had a great time and were lucky enough to fill our own bags to take home! I wonder what you have used them for? Don't forget to give them a good scrub first! We also filled several huge sacks and Mrs Hague dropped these off to Mrs Fryatt, our school cook, to use for our dinner. We can't wait to try them! Finally it was time to come home. We spotted lots of signs of Autumn along the way - fallen leaves, acorns, blackberries, the changing colours of the leaves on the trees. Maybe you could go for walk and see what you can see? A huge thank you (as always) to Mrs Hague for allowing us to pick potatoes to take home, and for all the information she shared. Thank you also to our fabulous volunteers who supported us in walking the children to and from the field, plus assisted with the digging. At our welcome meeting we discussed several ways in which you can help at home. Hear your child read their home reading book daily when it is sent home. Can you hear the sound and recognise the matching letter? Click on the book and read the stories. See if you can read the word then listen to it. Can you match it to a picture? Can you count to 5? What about 10? Now try 15?